Several years ago, I originated a long-distance shamanic project to serve tortured Moon Bears rescued by Animals Asia Foundation (AAF), founded by Jill Robinson. The program The Star Gazer Shamanic Moon Bear Project continued for almost thirty months. In this work, I matched a volunteer shamanic practitioner to shamanicaly serve a Moon Bear rescued by AAF in China or Viet Nam. These were captive bears that lived in coffin-sized cages in bear farms. Trapped, the bears’ bellies were cut open to insert crude hoses into their gall bladders. The bears were “milked” for the bear bile, which was used for traditional Chinese medicine, and sold to the black market. AAF veterinarians, who volunteer to work with the bears, and who know the illnesses these bears face upon arrival at the sanctuaries, have remarked that it is miraculous that the bears can survive in the farms. And many do for decades. These are conditions under which humans and other species might not survive for a week. In their cages on the farms, they cannot stand or turn, are underfed and dehydrated. They often live in basements or barns with very little light. When AAF does a bear rescue, it is uncertain if all the bears will make it back to the sanctuary alive. Some do die en route, and never receive the medical care and love AAF offers in such abundance. Medical triage is the priority for the bears upon arrival at the sanctuary. Many of the bears need to have their gall bladders removed, and all of them carry infections, and psychological damage, as well as a host of other painful and heartbreaking ailments that illustrate the abuse they have suffered. The demands for the volunteers of this shamanic project were many, and this was not an easy project to join. A lot of time and work on a daily, and then a weekly basis was required of the practitioners, and stringent ethical standards had to be followed. Each practitioner was assigned one bear to work with for one year; if that bear died, another bear was assigned. Some volunteers left because of heartbreak after their first bear died, but the majority did not. Very seasoned shamans, as well as newer shamanic practitioners, volunteered, but even the most experienced practitioners, who had worked with extremely ill or disturbed human clients for decades, said they were horrified, repulsed, and shocked by the suffering these bears had endured. The bears’ suffering seemed to cut deeper or create new heartbreak in ways working with humans had not. I remember one participant who was assigned three bears in succession over the period of a month. As she journeyed to work with the first two, they died in her care, and were pyschopomped. Later, we discovered through Jill’s Blog on the AAF website that her bears had died at the times she was working with them. Still very shaken, but undaunted, she asked to be assigned another bear to work with the day after her second bear died. But when her third bear died one night as she was working a week or so later, she called me at 2 a.m., sobbing. So much pain, so much suffering. A month later, she asked to serve yet another bear. The profound willingness to serve, the bravery of the volunteers humbled me. It was a new definition of what it really means to show up. And the victories, bears surviving and beginning to thrive, were what kept us going, of course. Because I had been a participant in the landmark NIH study, a grant given to Kaiser Permanente to study the clinical efficacy of shamanism, I knew I did not want to create a program that “proved” shamanism works. It was a strange experience to see shamanic practitioners work with NIH and Kaiser strategists to create a “measurable” program, one that could prove or disprove the efficacy of core shamanism from the western allopathic model. While I understand the potential value of the allopathic community’s research into the efficacy of core shamanism, I didn’t need to prove that a 100,000 year-old modality worked. From the start, I had one goal and one goal only: to offer shamanic cures to suffering Moon Bears who wanted them, who agreed to receive the work. I never cared if the program was “recognized” or studied. But many people followed the healing story of the project through many editions of the FSS Journal. The most important ethical guideline for the project was simple: the bear had to give his or her permission to the practitioner before shamanic work began. While with humans this is a straightforward process, it was far more subtle with a bear. One bear I worked with did not say “no,” but was extremely frightened of me. My helping spirits changed me into a stone that the bear liked to play with, to rest his head on. Slowly, I began communicating in “rock speak,” and eventually allowed my real self to be seen. By then, the bear wanted the work; he trusted me completely. However, when a bear would lunge at a worker in a journey, clearly enraged and telling him, through his actions to get out, practitioners were instructed to respect the bear’s decision to refuse the work. Knowing what the bears had suffered at the hands of humans, it was ethical and honorable to leave any bear in peace if he did not want to work with a human practitioner. In fact, very few bears absolutely refused treatment, a result that surprised me. Why would they trust us? That turned out to be a seminal question for me, and one I’ll talk about here. Since the program dissolved three years ago, I have been silent about the biggest lesson learned from the program, the teaching given by the recovering bears themselves, and the helping spirits. Many people have written and asked me questions about the project over the past three years, and in part, I am offering this article so people can understand that there was a universal teaching that came from the project entire. I am writing about this now, because I finally understand the teaching well enough (through both contemplation and journeying) to share the most important gift we received from the bears. This teaching has inspired me, changed me. And I think it’s important because it strikes at the heart of being a human in today’s chaotic world. It was a confusing message. Help how? The bear spirit that appeared was Polar Bear. He seemed completely out of place in the journey, rather like a walk-on character who arrives on stage for a moment for no discernible reason, and then stalks off. After trying to figure out ways to serve bears suffering from global warming, it became apparent that, precisely because the problem is global, there was very little I could do to substantively serve these bears. After a long time of wrestling with the challenge, I felt defeated. But, I reasoned, if I could not help the Polar Bears, perhaps I could do something to help the AAF Moon Bears. I had been following Animals Asia work for many years, and decided to write Jill, the foundation's originator and president (and my own personal heroine), to ask if I could form a coalition of international, experienced shamanic practitioners to do long-distance shamanic healing for the rescued bears. Two months later, I received a letter from Jill saying that Animals Asia wanted me to proceed. From the project’s inception, I knew there would be little feedback coming from AAF. Like most nonprofits, they did not have the staff or time to cull and shift through all the reports we sent, and address each journey individually (all of the reports, which consisted of the notes all the practitioners took about their journeys, averaged 50 pages). I tried to send the reports weekly in the beginning, and discovered it was just too time intensive. So the reports were sent every two to three weeks. As the project progressed, we gleaned almost all of our feedback from the AAF website, and Jill’s excellent blog about the progress of the bears. So we worked, trusting the helping spirits to do the work, and relying on the blog for feedback about empirical improvements in the bears’ health. Not receiving direct, immediate feedback on their work was a huge challenge for many of the shamanic bear workers in the beginning, but provided some of the best training I had ever received in learning to rely solely on the information we received directly from the spirits. Shamanic work would be done for a bear that was encouraging, but we always read Jill’s blog to see if the shamanic work had attenuated the bear’s health in this reality. So there was a time lag between when the work was done, and finding out if the bear who had received a cure was changed by the work. When a volunteer helped a bear die and transition, we would later read the news that the bear had, indeed, passed away. But sometimes, we got no feedback at all. Because I was the conduit between the volunteers and China, I was in the unique position to observe the evolution of the bear workers’ process as the project progressed. Because I talked with the bear workers, and read their notes about every journey they did, I was able to see patterns no one else could observe. From the first to the last, all of the bear workers experienced three emotions when they joined the project. The first two were their love of animals, and deep compassion for the bears’ suffering. There is no way to prepare yourself for what these bears look like after their brutal captivity, for the stories about the torture they endured before arriving at the Animals Asia sanctuary. And most of the practitioners had never heard of the AAF until they joined the project. A few practitioners refused to visit the AAF site because they felt they could not look at the suffering. But most did, and they were in shock. And they were all enraged at the bear farmers, unable to grasp why or how any person could do what these farmers did to the bears. I understood. That was the way I felt when I first found Animals Asia several years before the shamanic project began. I cried every time I visited the site for many months before I could begin to follow the stories about the rescued bears’ progress. But what I learned during this time, spurred on my the spirits’ teachings, was that whether I looked at the pictures and became more educated, or looked away, to choose to live in ignorance about their condition, the bears’ suffering was a part of me. A part of everyone. Every minute of every hour of every day of every month of every year, these bears were in hell. Not looking, not staying aware was a way to cocoon myself in a kind of fractured denial, a way of numbing myself to stave off my own intense reactions to their torture. So the conversations I had with the bear workers about their feelings when they first saw photos of the bears on the AAF website, echoed my own experiences. How, the volunteers asked, could anyone ever do this to an animal? Some volunteers were so angry they felt a death sentence was righteous for the bear farmers, the people who “milked” the bears for their bile. I understood their rage because I had felt it as well. And although some of the project’s very seasoned shamanic practitioners had worked with very wounded and disturbed people through decades of work, the suffering of these bears cut deeper and seemed somehow more heinous. What humans do to humans when they wound or maim is unfathomable, but what humans do to other species is anathema. Animal torture seems to touch us in a different way. And, that, in itself, is telling about how we regard our own species. The desire for retribution for the bear farmers ripped through almost every volunteer who joined the project. As I began to work with my spirits on why this was happening, I was told that our rage was self-protection, a defense system. The spirits did not elaborate much past that. And repeated questions and queries did nothing to break their resolve to not discuss the matter with me. People defend themselves with rage – this was the teaching. But the spirits clearly did not want to explain this more deeply, to answer the many divination questions that arose in response to this teaching. In retrospect, I now know I was not ready to hear more. It would have broken me. I would not have been able to continue the work. So I began my own journey within the greater bear project. To wonder what I was defending myself against, what we were all defending ourselves against, when we felt such profound anger for the farmers who imprisoned the bears so cruelly. I began researching. This practice – bear farming – only began in the late 20th century, but the use of bear bile and bear gall bladders as medicine began more than 3,000 years ago. Moon Bear, painting by Don Hazeltine. Copyright 2000. Although this is a noted historical origin, I often wondered if the original knowledge that bear bile can be a powerful curative for certain medical conditions was a shamanic one. In the days of the indigenous people who hunted in that region, I am sure that when a Moon Bear was taken for sustenance that the bear was honored for giving his life for the tribe. In this kind of culture, every part of the body would have been used for something. No, I cannot be sure if it was a shaman who first discovered how bear bile might be used, but it’s logical to assume that it was a shaman who first used the bear’s gall bladder as powerful medicine to cure illness, just as rib bones were fashioned into utensils, and skins were used for clothing. By contrast, the obscenity of “bear farming” is illustrated by its very name. This is not a case of some tribe using one bear for the good of the whole tribe, the bear’s life taken with humility and with honor, with ceremony and reverence. Of course, there is no honor or gratitude in treating bears as a commodity. And it is illustrative of the cruelty of species superiority, our unconscious belief that homo sapiens are superior to every other species of flora and fauna. Over time and through journeying, I began to realize that many of the bear farmers really had no other way to support their families than with bear farming. Then the spirits asked me this question: if I had a child who was looking up at me with hunger, would I do anything to feed her, especially if the “anything” was culturally acceptable? I honestly could not answer the question. All I knew at this point was that these people were suffering. Not good or bad people – suffering people. Judging them only makes us feel righteous, but are we really superior? Such questions from the spirits and my own contemplations spurred my need to understand how humans can intentionally create such suffering in the world, and feel oblivious to its effects. And, often in conversation with bear workers when I asked them the question the spirits had asked me, many of the shamanic volunteers could not answer it either – if this was the only way you could feed your child and it was considered ethically correct in your culture to keep the bears, could you do it? Some said no, but many more were unsure. And some journeyed on it. The rage began to turn into confusion. But while this question is an important one, it is only the first question we had to answer. Humans always want to find the villain responsible for an injustice. And so the rage was not quelled; it was transferred. The blame shifted to the Chinese government. Since Animals Asia began its work in 1998, they have influenced and educated the Chinese government about the torture Moon Bears endure in bear farms. “In December 2009, 19 of China’s mainland provinces committed to becoming bear farm free. Another province, Shandong, closed its last bear farm in 2010.” AAF’s educational work with the government has birthed change, although bear farms are still legal in China. For those of us who love these bears, this is agonizingly slow progress, but it is progress. Once the shamanic bear workers understood that the government is starting to change, albeit slowly, anger shifted again. This time to the Chinese medicine physicians and the black market. The end users of the bile. There is a quiet revolution going on in Chinese medicine, where bear bile is now considered an untenable choice for ethical practitioners. It was a big day in Cheng Du, China, hometown of Animals Asia, when the Chinese medical practitioners posted large signs in their windows: “We will not use bear bile in our medicine.” Studies have shown that bear bile collected by these bears is toxic, which makes sense because the bears are ill. Whatever medicinal efficacy of bear bile when it was first discovered was now being destroyed by the bears’ own tortured bodies. And there are new substitutes for bear bile that can be used in Chinese medicine now. But all this was only a part of the reason why so many Chinese medicinal practitioners stopped; the other reason was compassion. The AAF had educated them. As this change occurred, anger was becoming more and more difficult for the volunteers, and for me, to hold. As the Buddha said (and I paraphrase), holding anger is like holding onto a hot coal; you burn no one but yourself. Still, the next target of the anger was, of course, the black market. There is no change in the greed business, in the abuse of animals for profit or entertainment. And there is no rationale that can justify it. I had worked with Bear on this as well. And what he taught me struck me through the heart. He asked if I had not ever participated in any activity which caused pain or suffering for an animal because I simply chose to do or buy something for my own need or pleasure. Moon Bear in Zoo -- zoos are a different kind of torture. I remembered the times I had gone to the circus or visited zoos as a child. The multitude of products I have used in my life that have involved animal testing. The movies I have enjoyed where animals were used. The huge quantities of meat I have eaten, much of it not free range or organic. The ivory necklace, intricately carved into a string of elephants, inherited from my mother (I cannot wear it or give it away for someone else to wear – it sits on my altar in memorial). I thought of the commercials I had seen where baby animals were used to sell product; what people don’t know is that most of these babies are declawed, and then either killed or (if they are very lucky) rescued by animal sanctuaries after they have been used for our entertainment. I thought of the products I have bought that have destroyed habitat for wild life. In short, I reached bottom, and I despaired. The problem of species superiority is glaring, and subtle. And it is an epidemic. Circus animals are a disgrace to humanity. And I realized that the black market, which sells bear bile for as much as $400,000 for two pounds, was not really very different from my neighborhood store that sold Big Agro meat products, or from the coffee store that does not support fair trade. Or from the power we all use that is generated from dams and other means that exploit nature. The examples of how I cooperate personally with all the ruination are so long that they cannot be listed. And I consider myself to be reasonably conscious, and I work at being a member of the one tribe. If the only abuse of animals in the world came from the black market, the world would be a far better place. Obviously, these people who intentionally cause suffering are committing heinous acts because they are causing deliberate suffering, but another evil is in our own denial that we are the problem. All of us. There are so many subtle ways we hurt and demean animals. We do it when we swim with a dolphin in an enclosed space. When we buy pets at pet stores. When we watch horse races. When we pollute the earth and our groundwater with poisons to kill weeds. When we flush an old prescription down the toilet. I was shocked to discover that “bear baiting” is still practiced in South Carolina, a practice where black bears are chained, and attacked by dogs. It’s considered great entertainment, even though illegal. However, the penalties if caught are financially negligible, and no jail time is meted out. And, as the demand continues to flourish for bear bile, Americans are starting their own lucrative bear farm businesses. . Finally, the research done, my own investigative journeys over, my shame about being a member of my species was complete. I noted that these feelings were experienced by many of the shamanic practitioners in the project. When you looked at what all the “villains,” what the farmers, governments, medicinal practitioners and black market profiteers had in common, there was one thing and one thing only. They were all human beings. I didn’t share these thoughts with the bear workers. But many of them came to understand this shame through their own work with the bears, and then would talk to me about it. In fact, many reached the same conclusion that I reached. There were several late-night phone calls with the volunteers who were unable to sleep, unable to live with the knowledge that we are, in some ways, a unique species, a separate species, the only species that intentionally causes suffering for the sole purpose of feeding our greed. Finally, I realized that only the helping spirits could tell me how to live with my depression and shame. And, as I discovered after a bit of research, these feelings are very common in our culture. I began to look into this shame in larger context. Google “I am ashamed of being human,” and you will see thousands of sites and forums with people writing about how ashamed they are to be members of our species. Simply put, many humans hate themselves or, at least, have great disdain for the very species that they are a part of. It took a long time for me to form the right divination questions to ask so I could live with myself and with my species. Finally, I journeyed to Bear with this question: How can I forgive myself for being a member of the human species? I remember my knees buckling as I sank down to the blanket, sobbing, when I asked the question. And what Bear did was simple, and changed me forever. He forgave me. He cured my shame. Because of his compassion, he forgave me. His love filled my spirit, and my self-loathing abated. Later, I asked him why he forgave me. He asked me, “How could anyone hold an unknowing child guilty when he has shown selfish tendencies?” And that was, indeed, how he saw us. As very young creatures who did not understand the many ways we continue to wound or destroy the one tribe. Our ignorance and greed come at the highest price imaginable. It is our terrible isolation from the one tribe. Our constant, albeit unconscious, fear of facing our denial is exhausting us. But we continue to live in denial as a species, and I understand that. Because to face it does bring you to your knees. And you don’t know when you are this broken if you will be forgiven or remembered. That’s the terrifying thing. Shamanic practitioners have a huge advantage; they know they can work with their helping spirits on seminal, monumental issues like this. But our culture is not a shamanic one so the majority of the people in our culture may believe that they will be forever damned for the ways their actions have harmed others. For them, denial must seem safer. As my work progressed, I saw the same miracle of healing being given to other bear workers in the project. It’s impossible to describe how these cures from the Moon Bears, so tortured by humans, affected the workers. Lost and in pain, I heard stories from many bear workers about their unendurable despair and shame about being human. And when they apologized from the depths of their hearts for being members of a species that had so tortured the bears, the tortured Moon Bears forgave them and loved them. Some volunteers called me when they entered this part of their process, crying, released from their shame of being a part of our species; some people spoke of their inability to judge humans harshly anymore. That their work was to unify us all with the one tribe, and not to further fractionalize with judgment, hate or rage. This feedback, that the Moon Bears actively forgave them, was a trend known only to me. It was one of the biggest miracles I have ever witnessed shamanically, and it gave me perhaps the greatest teaching I have ever received from the spirits: all of nature is loving, and it is compassionate. We only need to look around at every single ecosystem in nature to see it. Every species is created with an ability to defend itself in unique ways, but none consciously choose to do harm except humans. And, when natural death occurs, we only need to look at how nature uses death. Dead leaves create food for the earth, and the very tree that birthed them. Dead animals provide food for others. Maimed animals are hunted by others to sustain, and to the keep both species strong. Forest fires, when forests have not been tampered with, clear out the forest and promote new growth. It is no accident that the most popular posts and videos on social media sites illustrate inter-species love and cooperation. Of course, these stories and pictures lift our spirits. I believe the huge popularity of these images and stories buoy us because they give us hope, a glimpse of how it all could be. I am not anthropomorphizing nature here. Obviously, nature is destructive in many ways. Hurricanes, volcanic eruptions, tsunamis – there are endless examples of the ways nature’s power destroys. Some people believe increases in global, natural disasters are indicators that the earth is becoming “angry” and retaliating. I do not believe that. I believe nature reacts to changes we have wrought in the basics physics of our environment. Nature is not “angry” with us, and the way I am sure of this comes from, yes, journeying and from contemplation. But my musings were confirmed by the empirical. Nature, I have seen, forgives. In all of this, in all of our denial, we have separated ourselves from being nature. And, again, the price we pay for this is acute loneliness, the feeling we are separate from everything else in the universe. Completely separate. We visit nature. We like nature. We go into nature. But we have lost the knowledge that we are nature. If you want to see an example of this, call someone you know “an animal.” This is a pejorative in our culture, an insult, although indeed, we are animals. Our ultimate salvation may rely on accepting this, and evolving toward being better animal humans. When Bear Workers received this blessing, this ultimate forgiveness from their Moon Bears, animals who had suffered some of the worst of human cruelty, the workers acquired a new sense of their own humanity, an imbued humility. A burden lifted from them, and a new dedication arose to stop wearing blinders, and become agents of change in a culture so out of sync with its own denial. In the quest to serve the Moon Bears, to heal the bears who had been so wounded, it was the workers who were given the most unexpected gift. By owning up to their own anger and shame, they were healed and they evolved. Now, like me, they were able to hold themselves, to hold all in greater compassion, and with a far greater understanding. By now, you can understand that the bears taught us that the biggest challenge facing our race now is denial. Denial of our own unconscious cooperation with archaic, cultural beliefs. We have been greedy children. But our cultural conversations about all of this have been dead wrong. We blame Monsanto and the politicians. We blame the corporate agriculture business and the bigots. We blame races and sexes and people of different religious persuasions. We need to begin to understand that expressing rage is not the way this is going to change. These people, who run these malevolent operations, whether commercial, political or religious, are also ignorant children who, I think, truly do not understand what they are doing. Not really. They are in isolation and denial. And while we rage about the injustices, we lose the bigger picture. Infuriating and dangerous as the greedy may be, they, too, are ignorant children, but the profits for their pleasure and greed anesthetize them to the pain that must be burrowed very deeply in their souls. It’s so easy to feel what may be a kind of righteous rage in defense, but it doesn’t change anything. It’s so hard to feel ashamed of your own species, of who you are. Really working through the denial will bring you to your knees. Or, at least, it brought me and the bear workers to ours. But we need to understand that the way we fall to our knees is seminal. There is true grace if we set intention. When the bears forgave the workers, when Bear forgave me, when I learned all of nature is truly compassionate, everything did change. Judgment, shame, and anger shifted. Sorrow began to evolve into self-compassion, and a large, but subtle, healing began. A far greater compassion for our species was born, and a sadness that so many humans hate themselves, something no other being in nature does. Since the Bear project, I am a different woman. I have my many highs and lows, of course, but I no longer judge people – or when I do, I notice it sooner, and I stop. I see the wizard behind the curtain. I no longer get caught up so easily in distractions that ultimately only create more anger and leave you weaker. I do not rail against politicians. I do not damn any religious group. I do not criticize the bear farmers. I do not judge people for eating or not eating meat. I know that plants cry out when they die, too. Life and death are partners, and no species is greater than any other. I try to be humble about the food I consume, try to be extremely conscious about where I spend my money, and try to live in harmony with the one tribe. In short, the only way I want to live anymore is only as a member of the one tribe. And as a child who needs to learn how to find new ways to change the status quo. That is the magnificent, creative challenge we are all faced with. When the project finally ended, only because I no longer had the energy to sustain the twenty-plus hours of work the project took every week, it ended with sadness and a sense that I had failed because I could not carry the work any longer. I don’t feel that way now. Our little project did not change the world, but it served the bears. And it changed us, helped us to understand some of the ways we have wounded our brethren and ourselves. It was the first step in a healing process. Lily, our bearded collie, dancing to the drum for the first time. Now, and forevermore, I am willing and grateful to accept that help because I need to learn how to become a better animal. I need all the help I can get. Humility is good. Acceptance of our own culpability is good. Destroying denial is good. It is our way back home. Home to our own species , which has such great power, and can offer so much love as a part of the one tribe only. 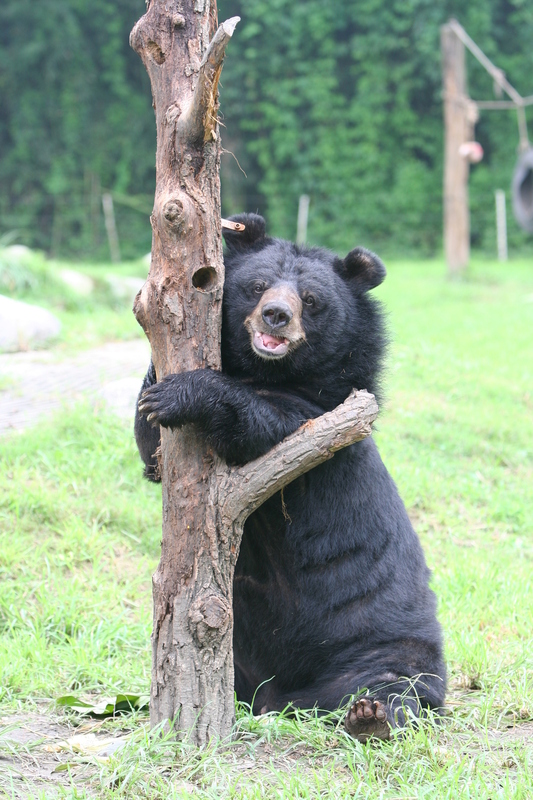 This article is dedicated to Bear and the moon bears, the bear workers and especially to Jill Robinson and Animals Asia Foundation, who are changing a culture entire, one bear at a time. I urge you to visit and donate to their new project Peace by Piece, dedicated to buying and then transforming a bear farm with 130 bears into a sanctuary and educational center. A rescue this large and costly has never been attempted before. The clock is ticking, and they must raise $5 million now. Please, donate here. I want to thank Jo Flagg, moon bear worker, for her beautiful painting, Freedom for the Moon Bear. And my husband, Don Hazeltine, for both MOON BEAR and I FORGIVE YOU. Many people have wanted copies of these paintings, and they can be found here. Ibid. Please note that in 2014 many more "commercial" bear farms have been established. Now bear farms exist with thousands of bears in one farm.